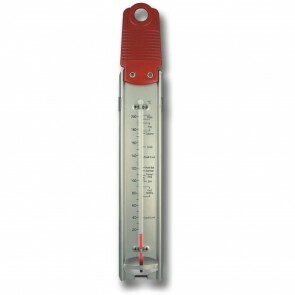 Traditional cook's thermometers made from stainless steel and brass are ideal when making sweets, toffee and jam. A toffee thermometer makes it easy to reach exactly the right temperature for caramel, hard crack, crack, soft crack, hard ball, soft ball and thread toffees. Our range of sugar and jam thermometers are traditional cook's thermometers made from stainless steel or brass and are ideal when making sweets, toffee and jam. The sugar thermometer, also known as a jam thermometer or toffee thermometer makes it easy to reach exactly the right temperature for caramel, hard crack, crack, soft crack, hard ball, soft ball and thread toffees. Both our sugar and jam thermometers have temperature scales that are clearly marked for caramel, crack, hard ball, soft ball, jam and sterilise. The stainless steel jam thermometer is supplied with a handy pan clip and plastic handle helping to ensure safe use at all times. This jam thermometer can then be securely attached to the preserving pan leaving the cooks hands free to stir or perform other tasks around the kitchen during the cooking process. The plastic handle on the stainless jam thermometer ensures no more burnt fingers. The stainless steel material of this sugar thermometer ensures it is very easy to keep clean. The brass sugar and jam thermometer is also very practical whilst also serving as a very stylish and decorative addition to any traditional kitchen. Our sugar and jam thermometers are the preservers best friend, helping to produce perfect results every time!